(Photo courtesy of Utah Division of Wildlife Resources) Hunting guide Larry Altimus, an Arizona resident, poses with the desert bighorn ram he killed illegally in southwestern Utah in 2014. In addition to a felony conviction and more than $30,000 in restitution and fines, Altimus has lost his hunting privileges in 47 states. Most big-game hunters can go their entire lives and never get a chance to legally shoot one of Utah’s desert bighorn sheep, a privilege reserved for fewer than 40 lucky hunters each year. After 21 failed tries, Arizona big-game hunting guide Larry Altimus finally landed such a permit in 2014 soon after taking up residence in Kanab, the Utah town on the Arizona line in the heart of desert bighorn country. But a jury later determined that Altimus was merely pretending to be a Utah resident for the sake of taking one of the state’s most valuable wildlife trophies. In addition to a felony conviction and more than $30,000 in fines and restitution, the act of fraud will also now cost Altimus his hunting privileges, under a recent decision by a Utah Division of Wildlife Resources hearing officer. The ban will apply not just in Utah, but 46 other states as well. While Altimus may still guide hunting clients, he cannot hunt for the next 10 years, according to DWR spokesman Mark Hadley. “He not only stole the permit. He used the permit he wasn’t entitled to to kill an animal,” Hadley said. Based in the southeast Arizona town of Pearce, Altimus, 69, operates his company Hunter Application Service and guides hunters in pursuit of trophy animals in several Western states. Altimus, who did not return messages seeking comment Monday and Tuesday, has hunted and guided hundreds of times in the Southwest and has appeared on industry magazine covers with his trophies. Altimus’ web site features dozens of photographs of him posed with clients and their deceased trophy animals, including moose, pronghorn, mountain goat, elk, aoudad and oryx, but mostly bighorn sheep. Altimus conducts much of his guiding on private land in Texas, where landowners charge hunters $60,000, on top of Altimus’ $9,500 guide fee. His service specializes in obtaining sought-after tags, according to the site. “The ‘tags of a lifetime’ are out there, you just need to get your name on one of them!” the site states. In Utah, desert bighorns are the most coveted big-game species to hunt. The state’s system for issuing tags for such hunts gives an advantage to those who have tried and failed to get permits in past years. Hunters earn a bonus point each time they unsuccessfully apply for a particular big-game species. Altimus actively sought these Utah tags, and by 2013, he had amassed 21 points toward a desert bighorn sheep, more points than earned by any in-state hunter, according to court records. Even with the trove of points, the chance Altimus would draw a nonresident bighorn sheep permit were still slim. “But if he claimed residency in Utah, he knew he had a good chance of drawing a permit reserved for Utah residents,” said DWR director Mike Fowlks. Under Utah law, however, hunters are not to obtain a resident hunting permit if they move to the state for a “special or temporary purpose.” As someone who makes a living helping clients obtain hunting tags, Altimus was well aware of the rules, according to Kane County prosecutor Jeff Stott. At trial last July, Stott had to convince a jury that Altimus knowingly took steps to illegally game Utah’s system for awarding sheep tags, which can auction for as high as $70,000. In 2014, according to DWR data, 5,174 Utah hunters vied for 35 desert bighorn tags, while 7,184 nonresidents vied for three. Big enough, it appears, for Altimus to uproot his life for a few months. In August 2013, he rented a house in Kanab, moved his belongings there and obtained a Utah driver license, according to Stott. Using the Kanab address, Altimus applied the following March, not long after meeting the six-month threshold for residency, and drew a permit to take a bighorn from the famed Zion hunting unit — just one of 11 awarded that year. “We proved it was all for this permit,” Stott said. 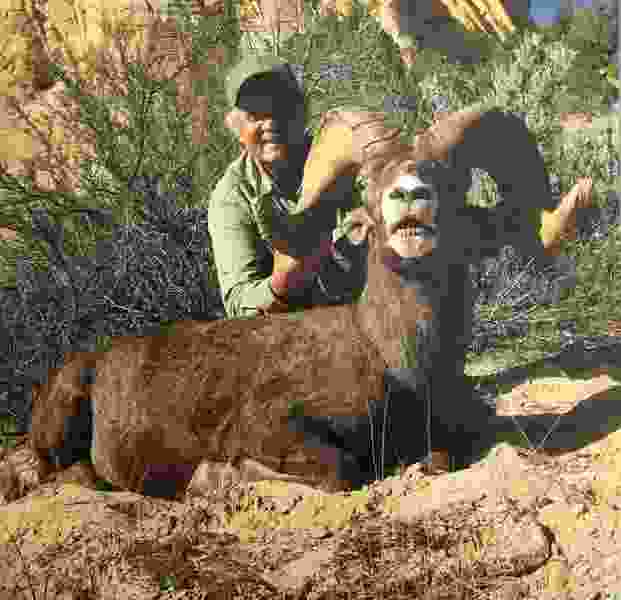 A few weeks after winning the tag, Altimus moved back to Arizona, then returned for the fall hunt, where he bagged a ram. After three days of testimony in Kanab’s 6th District Court, the jury returned a guilty verdict for wanton destruction of wildlife, a third-degree felony. Judge Wallace Lee ordered Altimus to pay DWR $30,000 in restitution, payable in monthly payments of $1,000 as part of his three years on probation. He also lost his right to possess a firearm and hunt in Utah during that period. Officials had already seized the ram trophy, whose prodigious horns curled into a full circle. But the real punishment was meted out by DWR, which filed a petition to revoke Altimus’ hunting privileges for 10 years in the states participating in the Interstate Wildlife Violator Compact, which includes all 50 states but Delaware, Massachusetts and Hawaii. A hearing officer affirmed the recommendation, although the order could be appealed to the Utah Wildlife Board.